We enjoy chestnuts in Autumn Japan there are some ways to enjoy it, picking,eating as meals and sweets. Nakatugawawa and Ena cities are some of famous chestnuts area, there are many great chestnuts shops and we can buy these products in Aichi as well. KURINTON is seasonal product September to December or Junuary. I got these at ``Suya`` JR Takashimaya. 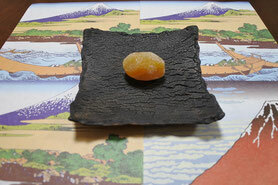 The Suya Kurikinton is made from only chestnuts and sugar. It mushy and creamy and it has simple chesynuts taste. Actually I did not know this kurikinton before I move in Aichi because usually kurikinton is totally diferrent. I like both of them. 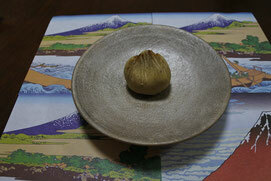 This is seared only on a kurikinton surface, I bought this at ``Taneya`` JR Takashimaya. It's also made from only sugar and chestnuts. I think it's a little richer. It's called ``kurinatto``. Useing chestnuts soaked syrop an year then make heat and cool again and again about a week after that covered with sugar. It's very tasty and savoury!! My family is really fan of this kurinatto so I presented this to my mother on her BD. I got this at ``Suya`` JR Takashimaya as well and not seasonal product so we can enjoy this all the time! There are five languages. The department stores have thousand of sweets normaly.